There is no point mincing words. The USA’s history in Latin America is one of aggression and imperialism. Some attribute US excesses, including support for right wing military dictatorships, to the Cold War. But US imperialist attitudes to Latin America have a continuity that reaches from the Monroe Doctrine of 1823, the annexation of Mexican territory in the 1840’s, the ‘Banana war’ interventions from 1898 to 1934, through the Cold war and continuing to the present day. According to the historian John Coatsworth, the United States brought down 41 Latin American governments between 1898 and 1994. The most famous cases include Panama (the US was a key promoter of Panama’s secession from Colombia and its creation as a country), Cuba, the Dominican Republic, Nicaragua and Bolivia all of which happened before the Cold war. US neo-colonialist attitudes towards Latin America are held by both sides of US politics. Most US politicians seem oblivious to these ingrained and chauvinistic attitudes, let alone ashamed of them. In 2013, President Obama’s Secretary of State, John Kerry, referred to Latin America as the US’s “backyard”. While perhaps only a geographical reference in Kerry’s mind, the comment has an offensive historical connotation for Latin Americans. It confirms that the US sees itself as entitled to intervene directly, or indirectly, in Latin American nations’ sovereign affairs, simply because of their physical proximity. Hilary Clinton is another example. In 2009, a military coup ousted Honduras’s democratically elected President Manuel Zelaya from power. Zelaya had overseen modest economic and social reforms in Latin America’s second poorest country. He introduced a minimum wage and pledged to finally resolve longstanding land conflicts between peasant farmers and agribusinesses. He was promoting constitutional reform at the time of the coup, when he was forced, still in his night clothes, onto a military plane which took him to Costa Rica. Latin American leaders and the UN General Assembly called for Zelaya’s reinstatement. But in her book ‘Hard Choices’, Clinton acknowledges that she pushed for fresh elections rather than the return of Zelaya. US assistance to the Honduran military continued throughout. The crackdown following the coup meant there were no conditions for free elections, the human rights situation deteriorated and the economy tanked. The best of the post war US Democrat Presidents in his views towards Latin America was probably Jimmy Carter. He at least started with good intentions. In his candidacy for president in 1976, Carter stated his commitment to a foreign policy that stood up to dictatorships which routinely violated human rights. Carter also negotiated an agreement with Panamanian President Omar Torrijos for the return of the Panama Canal to Panamanian sovereignty. But, by the end of his presidency, Carter was weakened politically by the Iranian hostage incident, and the Sandinista Government’s attempts to spread armed revolution to El Salvador. Towards the end of his Presidency Carter was sending weapons and money to El Salvador’s military, which, together with para-military death squads, was violently repressing unions, Christian base communities and other civilian organisations. This was despite a 1980 letter from El Salvador’s Archbishop, Oscar Arnulfo Romero, pleading for an end to the military aid. Within weeks of the letter Romero died while giving mass, assassinated by a death squad’s bullet. The constant refrain of US governments is that the US is aims to promote ‘democracy’ in Latin America. Again this refrain has deep historical roots. It is linked to US cultural myths such as ‘manifest destiny’ and American ‘exceptionalism’. Manifest destiny, a phrase first coined in 1845, holds that the United States was destined, by God, to expand its dominion and spread democracy and capitalism across the American continent. American exceptionalism holds that that the US is unique among nations with respect to its ideas of democracy and personal freedom. These myths conveniently overlook very deep flaws in the US’s own democracy. Although relatively progressive for its time, the US constitution reflects the slave owning society from which it was spawned. Slaves of course could not vote. But to preserve unity and to diffuse differences over slavery, the constitution gave the southern slave owning states the right to count three-fifths of their slave population when it came to apportioning the number of a state’s representatives to Congress and to the Presidential electoral college. The USA’s electoral college system is anti-democratic because it means that US citizens do not directly elect the President. And, as occurred with Donald Trump, the person elected President is not necessarily the person who wins the popular vote. Democracy in the US is also heavily conditioned by the influence that corporations yield over the body politic. Economist Jeffrey Sachs has identified a “corporatocracy” comprised by four economic sectors: the military industrial complex, Wall Street financial firms, Big Oil and the private health care industry. As for personal freedom the USA leads the world in incarceration. While the USA has only 5 % of the world’s population, it has nearly 25 % of its prisoners, about 2.2 million people. 20% of inmates are regarded as having serious mental illness. Blacks are 12% of the total population but constitute 33% of the prison population. Latinos are 16% of the total and 23% of the prison population. One personal “freedom” citizens do have is the freedom to bear arms. Three in ten Americans own a gun and 67% say the main reason is for protection. 44% say they personally know someone who has been shot, either accidentally or intentionally. 66% want stricter gun laws. But US democracy is seemingly incapable of delivering this outcome, due at least in part, to the influence the National Rifle Association yields over members of Congress. In any event, it has never been promotion of democracy or personal freedom that has laid at the heart of US interventions in Latin America. It is preservation of US commercial and geo-political strategic interests that drives US foreign policy. We can add to this the domestic political objective of catering to the Florida Cuban lobby. Comprised mainly of right wing Cubans, and led nowadays by Marco Rubio, the lobby’s political influence extends beyond its numerical strength because Florida is a key swing state. Florida has not voted for a losing Presidential candidate since 1992. The result in Florida in 2000 determined George W Bush’s win over Al Gore. In 2016, Florida voted in favour of Donald Trump by a margin of 1.2%. Trump won 54% of the Cuban vote and Hilary Clinton won 71% of the non-Cuban Latino vote. Probably because of Florida, Obama waited until the last year of his Presidency before announcing a process for normalisation of relations with Cuba, an opening which Donald Trump promised to reverse during the Presidential campaign. Trump subsequently reinstated travel and trade restrictions against Cuba. The US history in Latin America is one of more or less constant opposition to governments of leftist bent. This includes not only the communist government of Cuba but also more moderate governments. A classic case was the Arbenz government of Guatemala. The CIA organised a coup in 1954 against this government following proposals for land reform that would have affected the US owned United Fruit Company. Apart from the Cuban missile crisis of 1962 leftist governments in Latin America have not posed any real national security threat to the USA. They have been opposed by the US principally because their programs do not correspond to the US’s preferred economic model or because they do not agree with the US on foreign policy or co-operate sufficiently in its failed “war” on drugs. But the abominable history of the US in Latin America leads some to suppose that every problem that occurs in a country with a leftist government must somehow be attributable to the actions of the US government in promoting regime change. There is also a tendency to regard it as some kind a waste of time for left leaning governments to look for political space, to try and develop a strategic approach to dealing with the reality of US power in the region. There is a kind “head in the sand politics of outrage” view, as if “calling out” US imperialism achieves something substantial in itself. It does not. One is reminded of Gough Whitlam’s immortal words “Certainly the impotent are pure”. The new left leaning President in Mexico, Andres Manuel Lopez Obrador (‘AMLO’) was elected to power on a program of ending corruption and it close relation, drug related violent crime, in Mexico. This is a huge task. He must also deal with Trump and his racial vilification of Mexican immigrants, not to mention Trump’s proposition that a wall will solve the problem of a porous border, when it is actually just a symbol- a xenophobic, right wing, fantasy. AMLO could, for example, allow Mexico to join ALBA- the alliance initially formed by Venezuela and Cuba which Bolivia and Ecuador subsequently joined (with Ecuador subsequently dropping out). He could adopt belligerent rhetoric towards the USA like Venezuela’s late President Hugo Chavez did. Like Chavez, he could embrace regimes and organisations hostile to the US like Iran, Syria, and Hezbollah. Like Chavez he could suffer from apparent amnesia regarding the slaughter of the Iranian secular left at the hands of Iran’s theocracy, the only virtue of which seems to be that they are not the US’s ally, the equally theocratic, human rights abusing, Saudi Arabian absolutist, monarchy. But instead AMLO has calmly but firmly reiterated his support for independence and self determination of the peoples, including Venezuela. He has argued for addressing the root causes of US – Mexican border issues, calling on Trump to join Mexico in the nation’s pledge to pay $5 billion next year to stem migration through jobs and development programs in Mexico and Central America. AMLO’s government, together with the Centre-left Government of Uruguay, has not dutifully fallen into line with the US and most of its allies by recognising Venezuela’s Opposition leader, Juan Guaido, as interim President but has instead called for dialogue and a negotiated solution. Hugo Chavez became President of Venezuela in 1999. From the time Chavez began his presidency until his death in 2013 most of the economic indicators for Venezuela had improved. Per capita GDP increased from $4,015 to $10,810 US. Unemployment reduced from 14.5 to 7.6%. Infant mortality reduced from 20 to 13 per 1000 infants. Oil revenues increased from $14.4 to $60 billion. Calorific intake rose. Illiteracy was eradicated. Millions achieved access to free medical services for the first time. Per capita spending on health grew from $273 to $688 between 2000 and 2009 while the rate of poverty halved in a little over a decade. Social programs known as the Bolivarian missions expanded access to food, housing, healthcare and education. The poor in particular benefited and even since the economy has tanked, many of the poor, who are often deeply Catholic, still hold Chavez in almost religious esteem. Worse still corruption has contributed to the train wreck in the economy. The currency control system lies at the heart of Venezuela’s economic crisis. This began under Chavez as a way to restrict access to foreign exchange and ensure enough dollars to import priority goods. But former members of Chavez’s inner circle, Hector Navarro and former Finance and Planning Minister Jorge Giordani say that under Maduro ‘a gang of thieves with no ideology’ has enriched itself from the currency system. The military, many of whom fill key cabinet posts within the Maduro government, are heavily implicated in this and other corruption. Those who are close to the government, including the military, have been able to get access to buy US dollars ‘cheap’ at the official rate set by the government. They have then sold those dollars ‘dear’ on the black market. The greater the distance between the black-market rate and the official rate, the more profitable the scheme becomes. Instead of using the US dollars paid for oil to pay to continue to fund social programs, government officials and their associates simply absconded with them, leaving ordinary Venezuelans to deal with the consequences. According to Giordani some $300 billion that should have gone into government coffers was absconded in this way. With the fall in the price of oil in 2014 and the shortage of foreign currency reserves, supplies of essential commodities ran out because the country could not import them. Neither could it produce them, partly because of its one dimensional oil dependent economic base, partly because of a hostile private sector, and partly because the nationalised industries or the co-operative sector could not do so. The government responded by printing money and with too much money chasing too few goods the result was hyperinflation. According to Carlson real wages have declined by more than 90% since 2013, due to runaway inflation. With the tanking of the economy social spending has also been cut drastically, with total expenditure reaching a lower percentage of GDP than the neoliberal years of the 1990s. 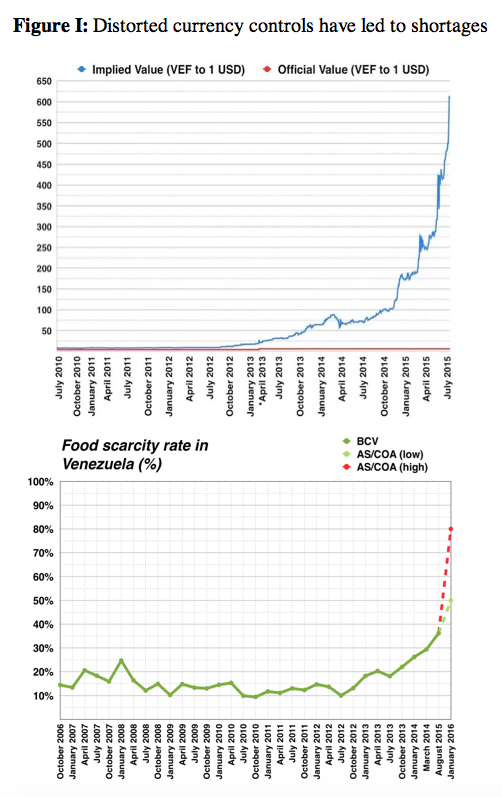 Venezuela’s hyperinflation has lasted 27 months to date. There have only been four other episodes of hyperinflation that have lasted longer. Hyperinflation destroys the life savings of anybody who does not have a foreign bank account into which they can deposit hard currency or who cannot find some other satisfactory hedge. With the mass exodus of more than 3 million Venezuelans since 2014, it seems fairly clear that, despite its promising start, Chavez’s model for ‘Socialism in the 21 Century’ has failed. The same Ana Elisa Osorio seen fighting the coup against Chávez in 2002 is now part of the Critical Chavismo movement. She finds that Maduro’s “authoritarianism” makes him “unworthy of the name Chávista”. Her comrade in that fight, Giordani, lasted a year in the Maduro government before quitting to denounce widespread incompetence, ineffectiveness, and unaccountability. At the same time as escalating its economic war the Trump administration has ramped up its political war. This has not only involved recognising Juan Guiado as interim President and calling for fresh elections which other countries have also done. More perniciously, the US has insisted that the Opposition must not enter into dialogue with the Maduro government to try and find a political basis for settlement. Guido, President of the National Assembly, is alleged to be part of a right wing student group groomed by a US funded regime training academy to topple Venezuela’s Chavista government and restore neo-liberalism. In any event his political future depends on support from Washington and he can be expected to follow its instructions. His claim to be recognised as interim President of the entire country is based on an unlikely interpretation of clause 223 in the Venezuelan Constitution. The clause deals with what is to occur when a President elect becomes permanently unavailable to serve due to a number of specified events such as death or medically certified disability. None of the specified apply in the current circumstances. But Guido’s claim is not necessarily the first “creative” interpretation of the Constitution. Indeed a constitutional crisis forms part of the political crisis in Venezuela. For example, the Constitution clearly contemplates that the National Assembly is the main, permanent legislative body in the country. The Constitution provides for a Constituent Assembly but, as the name implies, such a body is normally a temporary body allowing the population to participate in the drafting of a new or revised constitution. After the Government lost control of the National Assembly in elections in 2015, Maduro created a new Constituent Assembly. The current constitution was developed by a Constituent Assembly under the Chavez government in 1999. But Maduro’s new Constituent Assembly was created through presidential decree. He also wrote the rules for its election. Maduro stated the new Constituent Assembly would be a ‘super body’ overriding the legislative power of the National Assembly. Maduro has offered dialogue with both the Opposition and the US. But US Vice President Mike Pence told a gathering of Venezuelan exiles in Florida “This is no time for dialogue. This is a time for action. The time has come to end the Maduro dictatorship once and for all”. Pence’s statement was accompanied by an implicit threat of military intervention by the US in Venezuela “All options are on the table” he stated, while warning Maduro not to “test the resolve” of the US. Offers to mediate dialogue by Mexico and Uruguay, who have not recognised Guiado as interim President, have also been rejected by the Opposition with Guiado stating he will not enter into dialogue with human rights abusers. The Opposition and Trump administration’s stance is contrary to calls for dialogue from the UN. UN Secretary General Antonio Guterres has urged parties in Venezuela to lower tensions and to commit to inclusive and politically credible dialogue. UN special rapporteur Idriss Jazairy, who reports to the UN Human Rights Council has stated “Sanctions which can lead to starvation and medical shortages are not an answer to the crisis in Venezuela… I am particularly concerned that these sanctions are aimed at changing the government of Venezuela. Such coercion by outside powers violates all norms of international law”. Mr Jazairy urged all countries to avoid applying the sanctions unless approved by the Security Council as required by international law. “Neither side appears willing to go down without a fight and new elections in these circumstances would be fraught with peril…an election now, if somehow organized, would amplify both the stark polarization between Maduro and the opposition — and the threat of civil war…The US’ move to recognize Guaido is provocative. The problem is that the US has a track record of bullying Latin America and staging interventions in the region. These US interventions, both direct and indirect, have resulted in dozens of regime changes over the course of more than a century…Even if Guaido proves successful in gaining power, the view that the US once again helped to orchestrate regime change will embitter Venezuela and the region for years to come. Instead of a US-led regime change, the two sides need to share power temporarily, until new elections, perhaps in 2021. It seems inconceivable, yet history shows this can be done. Poland’s successful transition to democracy in 1989 provides a pertinent example. In early 1989, Poland was on the brink of catastrophe, with martial law, a hugely unpopular Communist government, a collapsed economy and an incipient hyperinflation… The Communist regime and the Solidarity opposition brokered a Round Table Agreement in 1989…The Communists would retain the presidency and the “power ministries” of interior and defense, while one of the Solidarity leaders became prime minister with the power to appoint his cabinet…Violence was completely avoided…Such a compromise would have Maduro remain as president, the military in effect hold the Ministries of Defense and Interior, and the opposition forces take over the civilian ministries and the Central Bank of Venezuela. Guaido, or some other leader in the opposition camp, would serve in effect as a prime minister, leading the civilian cabinet, and guiding Venezuela’s economic policies. Elections would be agreed upon for 2021 or 2022, perhaps under a semi-parliamentary system by that time. There is not much to suggest an outcome along the lines suggested by is likely. Part of the problem is that US allies, who might otherwise support dialogue and a negotiated solution, fear that even this relatively neutral position will lead to criticism from the Right in their countries that they are defenders of Maduro, or worse still, his economic policies. Spain’s leftist party PODEMOS suffered electorally from its previous support for the Venezuelan government, which it has now retracted. But US allies turning a blind eye to breaches of international law and to the deliberate escalation of tensions in Venezuela by the Trump administration is a very dangerous precedent indeed. Trump is not looking for peace. Likely to be frustrated by Democrat refusal to fund his wall, if the Venezuelan military remains loyal to the Maduro government, Trump could easily consider that invading Venezuela will give him a much needed political win. Who will be next after that? Cuba, which only a few years ago was on the verge of normalising trade relationships with the USA? Or will AMLO’s government in Mexico, which is committed to democracy and the rule of law, be undermined by the Trump administration for its refusal to recognise Guaido and refusal to pay for Trump’s wall? “The United States government is making several assumptions: that the military is on the verge of changing sides; that it will do so in a disciplined manner; that Mr. Maduro lacks popular support; that Venezuela’s foreign allies, notably China, Cuba and Russia, lack the interest, will and means to support their ally; and that bygones will be bygones after a quick regime change. Moreover, it should not be too hard to conclude that Donald Trump is an impulsive and dangerous man. US allies who fail to recognise this and to stand up for a rules based international order do so at everyone’s peril.